This week’s #SproutChat focused on The State of Social Customer Care. As highlighted in our recently released 2015 Sprout Social Index, social customer care is becoming more critical than ever. 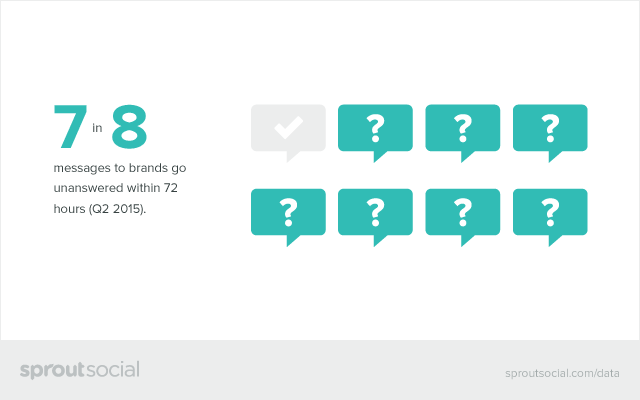 In fact, 7 out of 8 messages sent to brands are not responded to within 72 hours, if at all. These messages represent opportunities for companies to correct poor customer service experiences or foster loyal customers into vocal advocates—and, in doing so, gain a competitive advantage. As Zendesk reports, 40% of customers switch loyalty because a competitor offers better customer service. Accurate, timely responses are always important, but how you prioritize your efforts depends largely on the nature of the message. Customer service issues and troubleshooting should be addressed immediately, whereas a fan who just shared your blog post can wait. Set a strategy to efficiently and effectively respond to all of your community’s feedback in the right order. Smaller organizations and startups might not have the bandwidth to manage the amount of incoming messages they receive. While hiring more people might be an ideal fix, costs could be prohibitive. Instead, figure out if the number of active social channels is appropriate for the size and scope of your team. Don’t hesitate to set or refine your customer service strategy. Start today. Online interactions are just as important as in-person experiences and should be considered as such—otherwise, you will be left behind. Have more thoughts about social media customer care? Share them in the comments below. And see you Wednesday at 2 p.m. CST for the next #SproutChat. We’ll discuss Facebook’s new features: livestreaming (available to celebrities initially) and the option to privately respond to public Page comments.